The old adage about having too many cooks in the kitchen sometimes applies when different interior designers are involved in creating a hotel space and the adjoining restaurant. The results can often be too much of a jarring contrast. Happily, this is not the case with the Trafalgar Dining Rooms which, incidentally – despite its moniker – is a singular space. 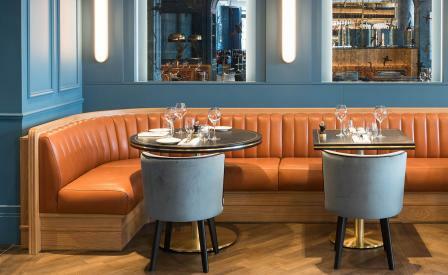 Studio AvroKO’s work in the lobby of the refurbished of the Trafalgar Hotel leads seamlessly into a warmly coloured cocoon of high arches, customised mouldings, coppery stool stands, and deep-set rust-red leather banquettes. Framed by customised chandeliers, handsome parquet flooring and two-tone marble detailing, the whole evokes a swanky art deco meets exotic maritime mood, itself a subtle nod to the building’s history as the original HQ for The Cunard Shipping Company. The best seats in the house overlook Trafalgar Square, with the dining room looking its best during the evening service. Chef Arnaud Delannay delivers a sophisticated menu that marries Mediterranean standards with a light British touch, recent standouts include crisp courgette fritters alongside crushed broad beans and garlic yoghurt, and a Stone bass fetchingly paired with celery roots, samphire and gently spiced broth.